SDL is proud to be participating in this years #16Days to End Gender Based Violence in the World of Work. This year we will be holding two events to highlight the harassment women in low-wage sectors such as service industry workers, hospitality workers and domestic workers often experience in informal work settings. According to a report published by the AFL-CIO “80 percent of female farmworkers working the fields in central California reported they had experienced sexual harassment.” On November 29, as part of Sister Diaspora’s #16Days of Activism to End Gender Based Violence in the Workplace and on International Women Human Rights Defender Day, we will be holding a vigil supporting the Coalition of Immokalee Workers and their groundbreaking Fair Food Program to end and prevent sexual assault and forced labor in agriculture. 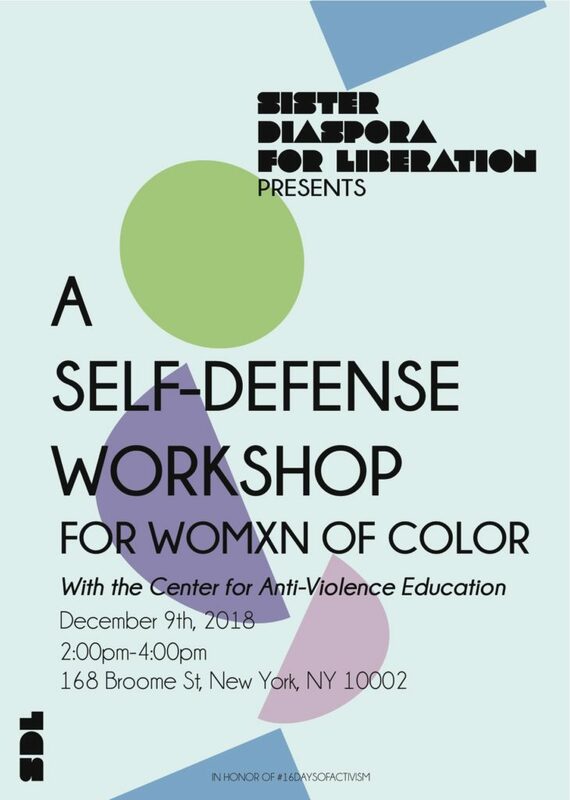 Then, on December 9th we will be hosting our 2nd annual Self-Defense Workshop for Women of Color which aims to empower women in NYC to defend themselves in high risk situations. 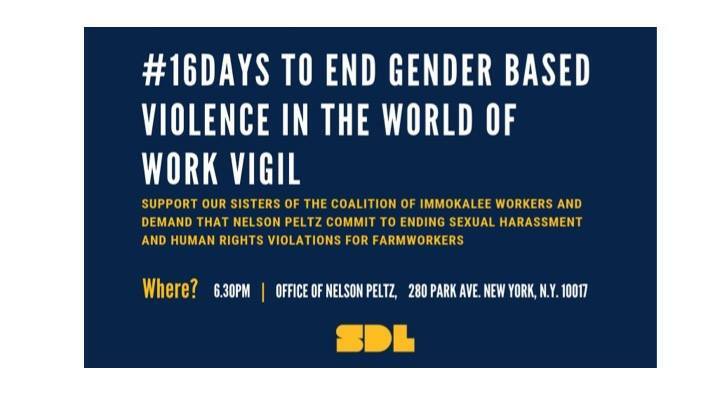 On November 29, as part of Sister Diaspora’s #16Days of Activism to End Gender Based Violence in the Workplace and on International Women Human Rights Defender Day, we will be holding a vigil supporting the Coalition of Immokalee Workers and their groundbreaking Fair Food Program to end and prevent sexual assault and forced labor in agriculture. Femme farmworkers in Immokalee, FL, have been on the frontlines of fighting workplace harassment for decades. Their fight continues with the national boycott Wendy’s, the only major fast-food chain to reject participation in the Fair Food Program. Here in New York City, we will be holding hedge fund billionaire Nelson Peltz (Chairman of the Board of Wendy’s) accountable for not taking action to end abuses in his company’s supply chain. 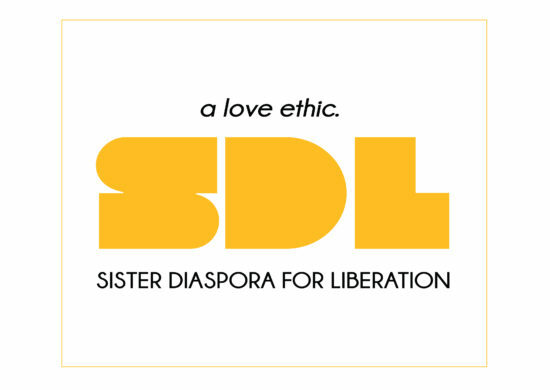 Sister Diaspora will be delivering a letter to Nelson Peltz demanding that he use his power to bring Wendy’s into the Fair Food Program as other fast food chains have done and commit to ending sexual assault and human right violations in the fields. attackers who are strangers, acquaintances or intimates. Basic self-defense strategies include a full spectrum of responses, such as avoiding danger, yelling, getting away, tricking someone, defending with physical techniques, and seeking help afterwards. This workshop is a safe space for all self-identifed womxn of color including LBTQ and GNC and is offered free to our communities. Donations are welcome. Registration begins at 1:30pm, please arrive at least 10 minutes before the beginning of the workshop to sign-in and store any belongings. Snacks and beverages will be provided, please contact us in advance if child care is needed.